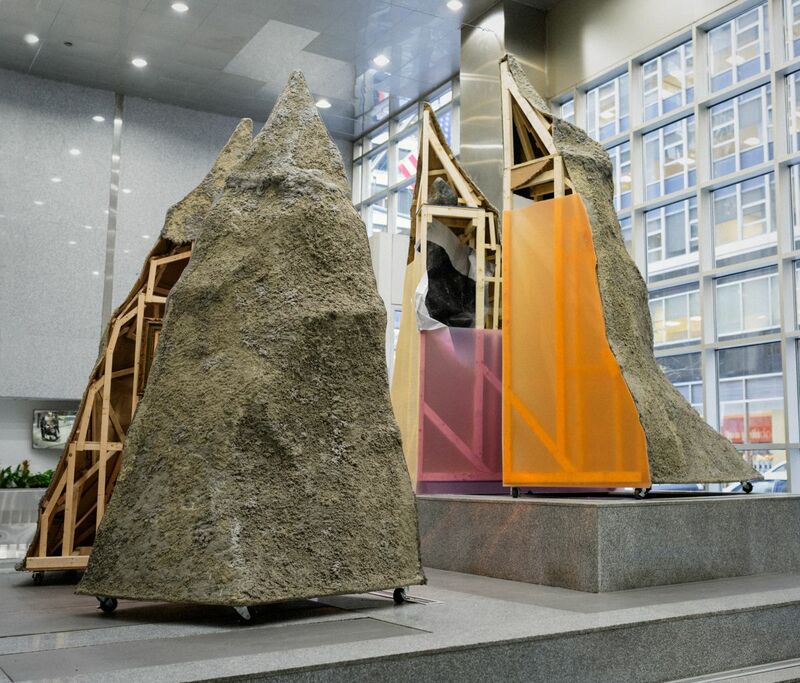 Art-in-Buildings is pleased to announce the newest exhibition in the lobby of 125 Maiden Lane: The Space Between, featuring works by Ira Eduardovna and Nadja Frank. Eduardovna and Frank are multidisciplinary artists who invent intensely detailed yet ambiguous worlds. 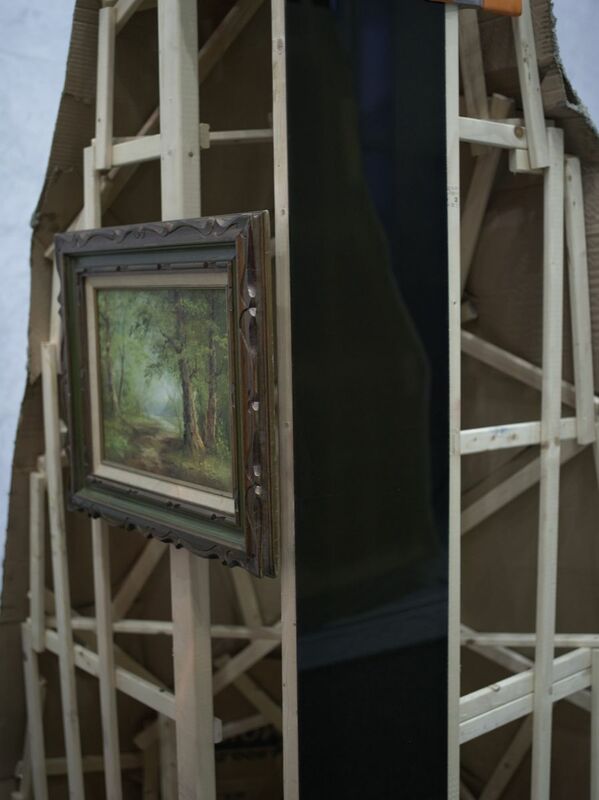 Through sculptural videos and objects, the artists engage in a conversation at once personal and global by investigating the space between travel and migration, dislocation and relocation, and political and ecological collapse, while anticipating the viewer as a necessary body to complete the work. 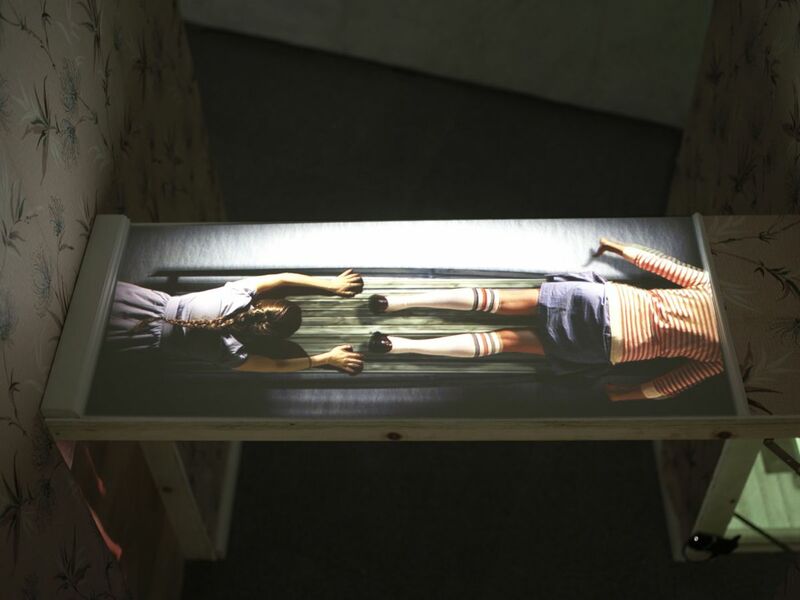 Eduardovna's multi-channel videos examine her personal history of dislocation, migration, and statelessness in broad, non-linear narratives. 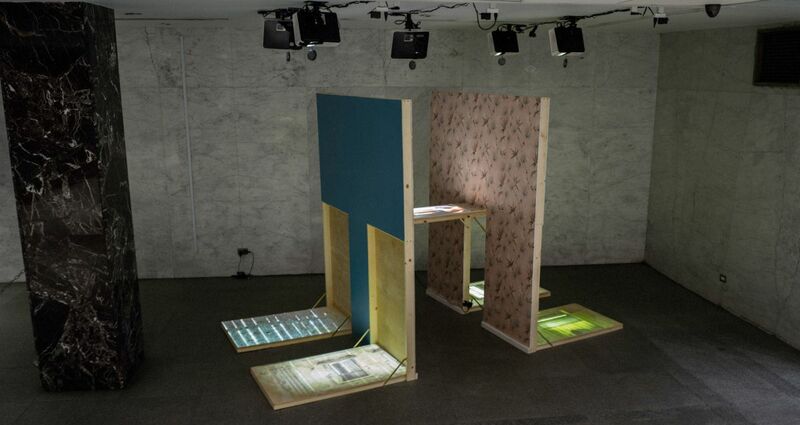 Chekhov Street # 5 is a six-channel video projected onto a large wooden structure that recalls a peeled open room. 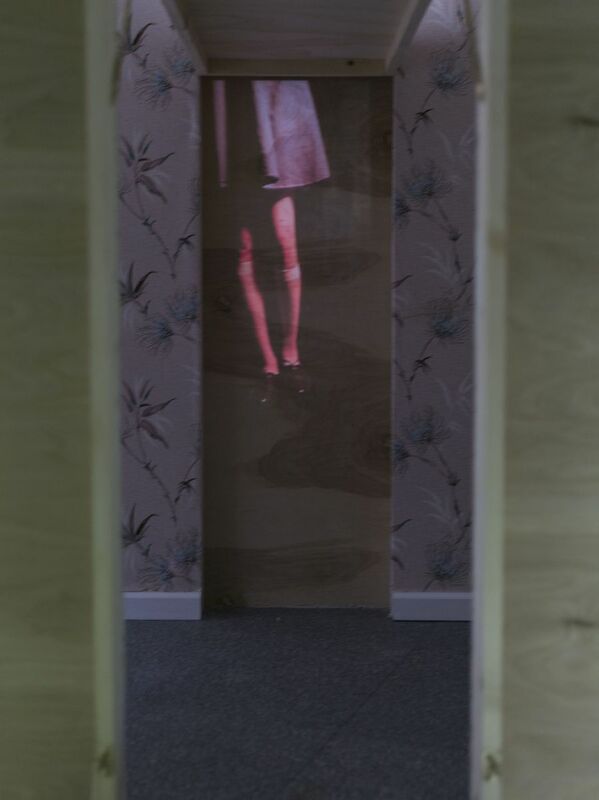 The projections include nearly life size figures, interiors populated by shadows, and desolate exteriors. 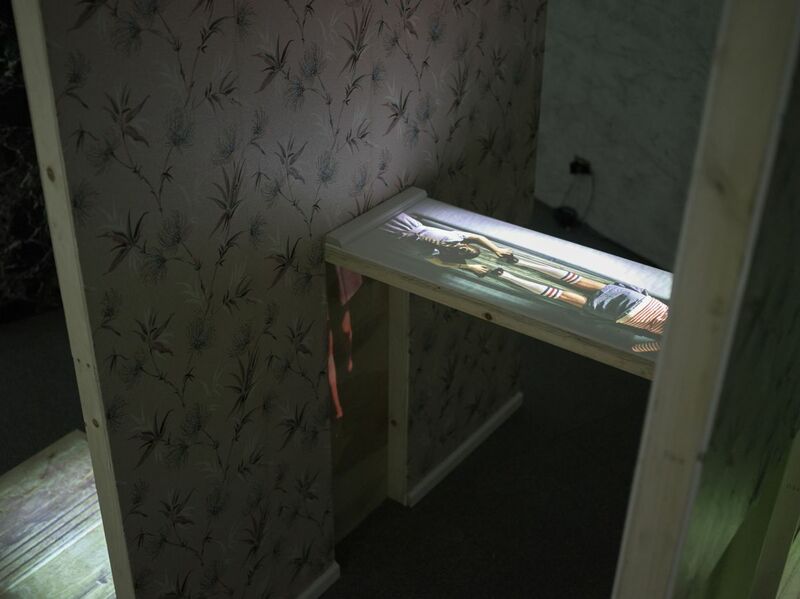 The work is a self-referential feedback loop: the labors of the figures in one projection are experienced as shadows or reflections in another. 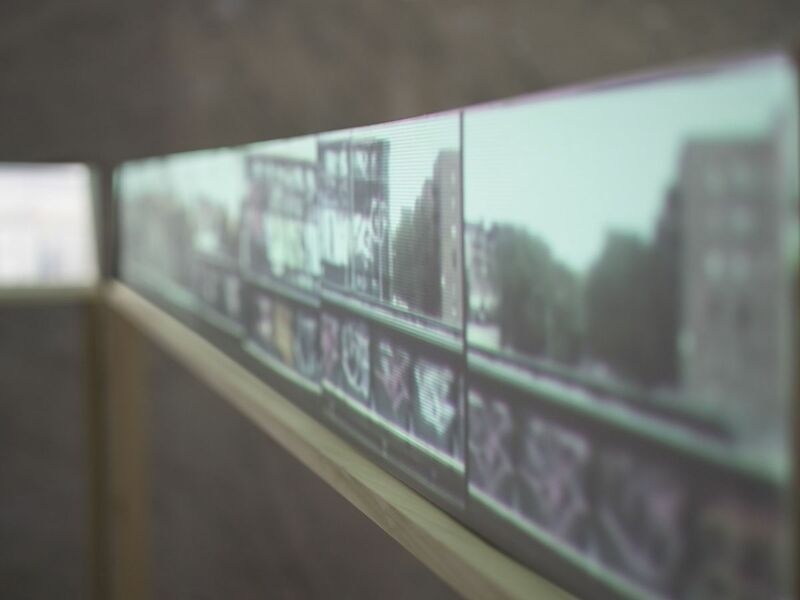 Across the lobby, Brighton Beach, a two-channel video also projected on a wooden structure, follows the journey to Brighton Beach as seen through every window of a subway train. 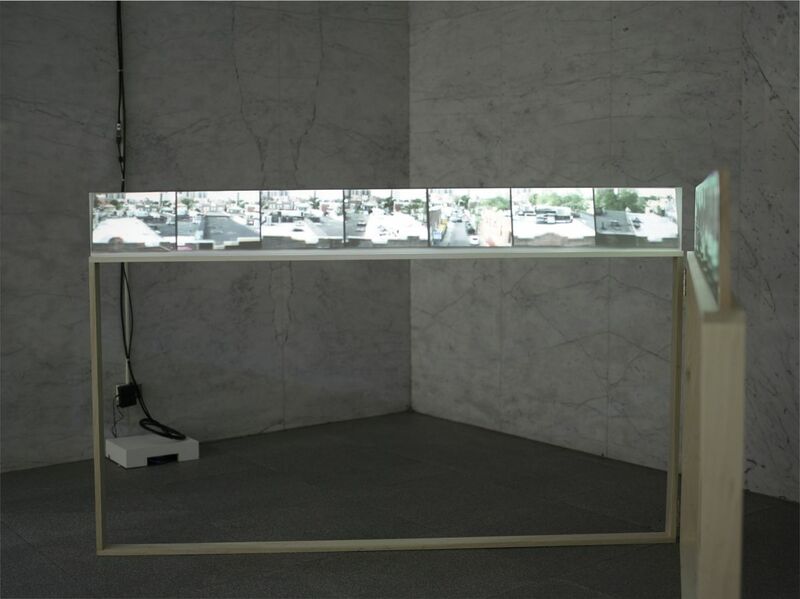 Eduardovna's video-sculptures put a special emphasis on windows; they are a transitional point between inside and outside, a framing device operating in tandem with the camera, and an invitation to watch the Sisyphean labors of the figures from a voyeuristic distance. Frank's practice explores the effects of human intervention in nature and the resulting loss of personal relationship with the environment. 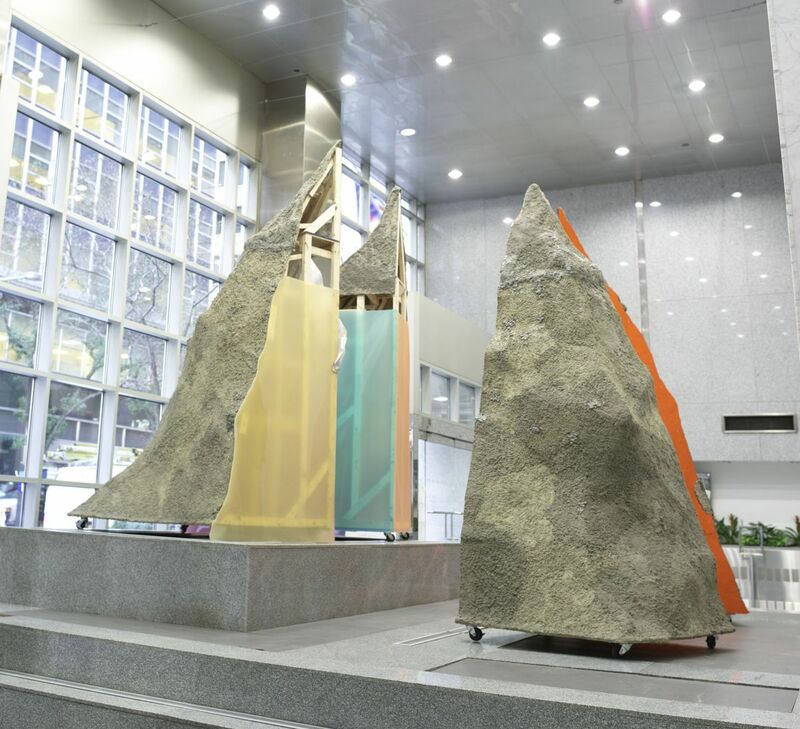 Her work is also concerned with the passage of time in a geological sense and man's efforts to capture and control the landscape despite our significantly shorter history. Frank's Red Headed Stranger resembles a quartered, miniature mountain. Though larger than human-scale, it is a diminutive geological formation. Looking between the quarters reveals an exposed internal structure partially masked by colorful acrylics and a found landscape painting in the style of the Hudson River School. The found painting functions as a window into a traditional depiction of landscape. As if plucked from the ridgeline, Frank's sculpture is a painstakingly handmade representation of nature that is both more tactile and more artificial than the depiction in paint. The exposed innards of the sculpture destroy the illusion that the natural world has been transported to Lower Manhattan. Like Eduardovna's work, Frank plays with the relationships between inside and outside and real and fabricated to engender a physical and psychological response to her work. Ira Eduardovna (b. 1980, Uzbekistan, lives and works in New York) received an MFA from Hunter College in 2012. She had solo shows at Momenta Art (Brooklyn, NY), Braverman Gallery (Tel Aviv, Israel) Vox Populi (Philadelphia, PA), Baruch College New Media Art Department Gallery (NYC, NY), Rosenberg Gallery at Hofstra University (Hempstead,NY), 1708 Gallery (Richmond, VA), and group exhibitions at The Israel Museum (Jerusalem, Israel), MOBY Bat Yam Museum of Contemporary Art (Israel), Galeria Arsenal (Bialystok, Poland), Royal College of Art Gallery, (London, UK), Center for Contemporary Art (Tel Aviv, Israel) among many others. Recent awards include: New York State Council on the Arts grant for film and electronic media in 2015, The Ostrovsky Family Fund for experimental Film in 2012 and 2014 and Artis Exhibition Grant in 2012. Artist residencies include: Smack Mellon Residency in New York 2014-2015, Omi International Art Center NY 2014, FUTURA center for contemporary Art in Prague 2013, and Wave Hill workspace studio program 2016. Nadja Frank (b. 1980, Lohr am Main, Germany; lives and works in New York) received her Diploma in Fine Arts with Honors from Hochschule für bildende Künste in Hamburg, Germany in 2008 and her MFA from Columbia University in 2011. She has exhibited internationally in numerous solo exhibitions (Denny Gallery/New York, 401contemporary Berlin/London, Margini Arte Contemporanea/Massa, Italy, Galerie Conradi/Hamburg, Germany) and group exhibitions (Kolbe Museum/Berlin, Socrates Sculpture Park/New York, Kunstraum Kreuzberg/Bethanien, Berlin, ICAS Gallery, Singapore, Chelsea Art Museum, New York, Kunst und Ausstellungshalle der Bundesrepublik Deutschland/Bonn, Kunstverein Hamburg/Hamburg, etc.). In 2011 she received a DAAD scholarship and EAF Socrates Sculpture Park Fellowship. 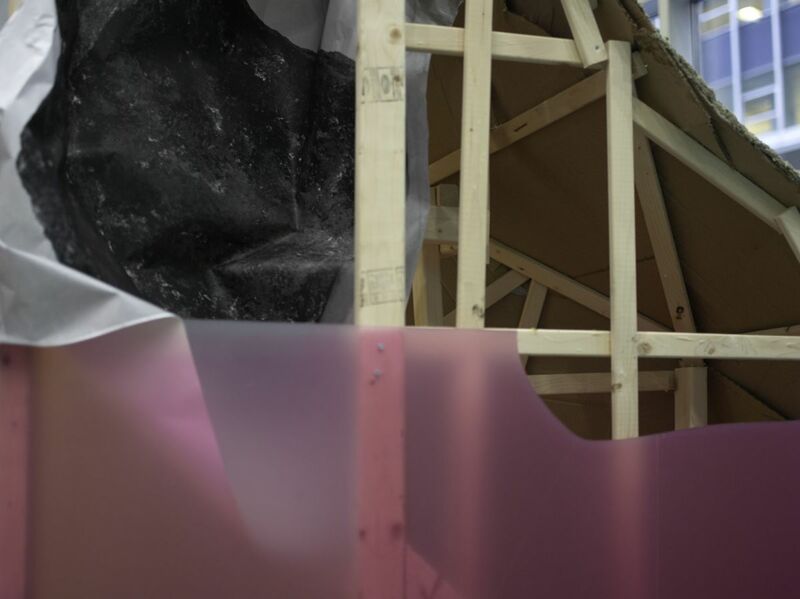 Nadja Frank is an artist in residence at the Lower Manhattan Cultural Council (LMCC) for the year 2015 - 2016. 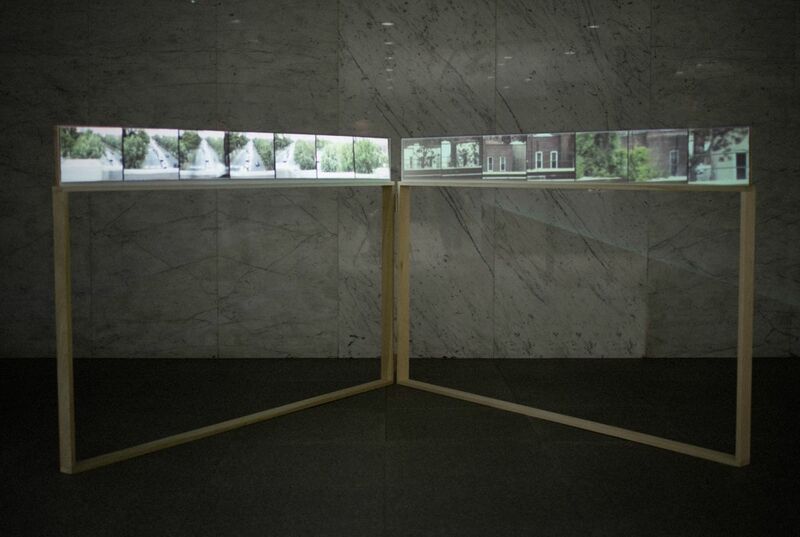 The Space Between is curated by Jennie Lamensdorf and sponsored by the Time Equities Inc. (TEI) Art-in-Buildings. TEI is committed to enriching the experience of our properties through the Art-in-Buildings Program, an innovative approach that brings contemporary art by emerging and mid-career artists to non-traditional exhibition spaces in the interest of promoting artists, expanding the audience for art, and creating a more interesting environment for our building occupants, residents, and their guests. 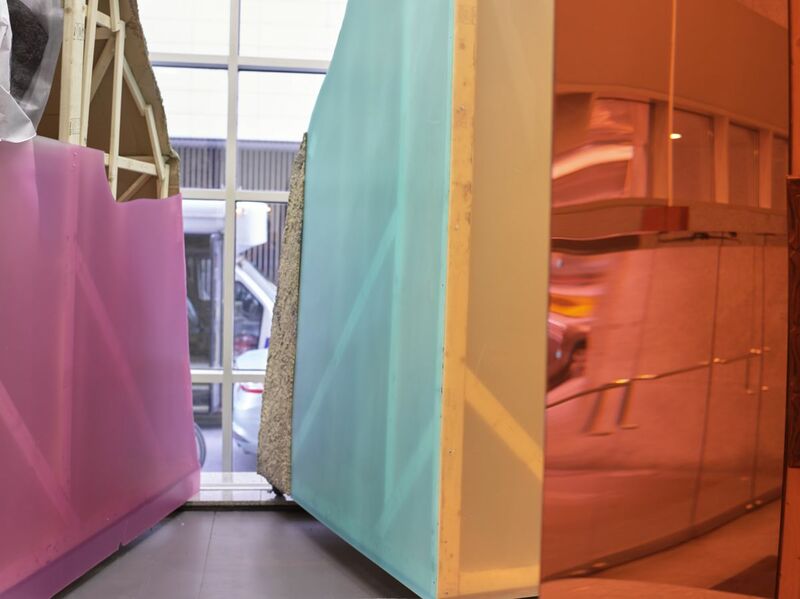 Read our interview with Nadja Frank and our interview with Ira Eduardovna on the Art-in-Buildings blog! 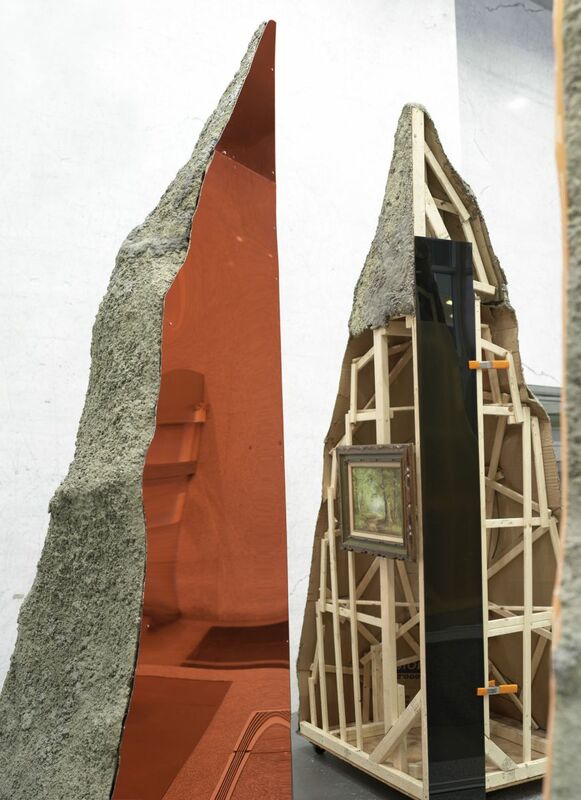 Read about Nadja Frank's work in context and Ira Eduardovna's work in context on the Art-in-Buildings blog!